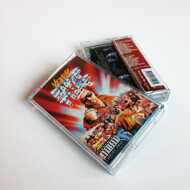 Limited Edition Cassette / Tape. Featuring MCs like Rah Digga, Camp Lo, Conway, MED, Nolan The Ninja, Stacy Epps, Ras Kass, The Legion, Shadez Of Brooklyn, Shabaam Sahdeeq, Marquee and others!! French producer Venom aka Le Justicier and The Vigilante drops his debut producer album "Ruff N Tuff". As a producer and remixer, he is probably best known for producing the latest Blaq Poet album "Most Dangerous" and Marquee "Femme Fatale" and also a bunch of underground bangers for Bankai Fam, F.O.D, Pete Flux or Dirt Platoon. He’s also half of the production duo Ninjustice with Kyo Itachi “Ruff N Tuff” is real "producer album" as Eric Sermon’s “Insomnia” or Pete Rock’s “Soul Survivor”, not just a compilation but an "action album” with a deep concept that sounds like no other and shows a new way to use music as a weapon. With his uncanny production skills, Venom punched the pads with brass knucklesand pushed his machines to their last limits. He programmed hard hitting drums and layered samples as bricks, then broke it with knife-hand scratches and ultimately let the world knows his productions strenght. The album features great artists and MCs like Rah Digga, Camp Lo, Conway, MED, Nolan The Ninja, Stacy Epps, Ras Kass, The Legion, Shadez Of Brooklyn, Shabaam Sahdeeq, Marquee, and others. The cover is hand-painted by the legendary Melki (who did classic movies cover in the 80's such as “Nightmare On Elm Street”, “Creepshow”or “Buckaroo”.